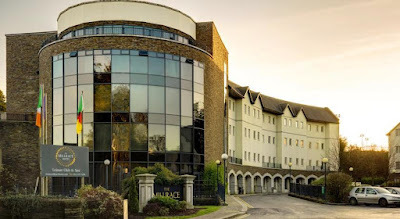 I am in Bunclody, Co Wexford, today [21 November 2015], and stayed last night in the Millrace Hotel, which stands on the edge of the Hall-Dare estate, with its magnificent parkland and walks along the banks of the River Slaney. Bunclody (Irish: Bun Clóidí, “at the bottom of the River Clody”) was home to generations of the Comerford family, and my great-grandfather, James Comerford (1817-1902), was born here. When James Comerford was born here, Bunclody was known as Newtownbarry, and the town continued to be known officially as Newtownbarry until 1950, when the change of name was made official by a local government order. A small channel or canal was first made for the town in 1775, drawing water from the River Clody, to provide drinking water for the residents through a system of underground ducts. It was re-cut around 1825, The canal still flows through the middle of the Mall or Main Street in the centre of the town, adding to the picture-postcard charm of this small town near the foot of Mount Leinster. One side is lined with lime trees, first planted in the early 1800s, although some have been replaced in recent years. The water comes from the millrace which in turn is diverted from the River Clody, and there are three small granite footbridges. Bunclody is well known for the Eileen Aroon Festival in July and August, and has continually received high scores in the Tidy Towns competition each year. The town was named Newtownbarry in honour of the heiress, Judith Barry, who married John Maxwell in 1719 and died in 1771. John Maxwell was MP for Co Cavan and later became the 1st Lord Farnham. Judith was buried at Christ Church Cathedral, Dublin. Newtownbarry was the scene a major battle in 1798, when the Wexford rebels were turned back at the bridge over the River Slaney. A rebel force led by Father Mogue Kearns from Kiltealy, attacked the town. Miles Byrne from Monaseed suggested if a detachment was placed at the opposite side of the town victory would be assured, but his advice was rejected. At first, the rebels took the town, and the garrison under the command of Colonel L’Estrange retreated towards Kildavin. But L’Estrange returned with reinforcements and drove out the insurgents with considerable losses, and those who survived made their way back to Vinegar Hill outside Enniscorthy. During the Tithe War, Newtownbarry was the scene of the Battle of the Pound in 1831, a clash between local people and the police and yeomanry, in which 14 were killed and another 25 wounded. The inquest opened at the Courthouse in Church Street on Monday 20 June 1831 and sat until Wednesday 29 June. But the jury of six Catholics and six Protestants – including William Comerford – failed to reach an agreement. The foreman became ill and was discharged. The other jurors were discharged, but refused to be sworn to secrecy. In the aftermath of the Battle of the Pound, and in the face of strong public outrage, the yeomanry were replaced by the constabulary as the first line of defence against civil commotion, and by 1834, there were 34 constabulary barracks, with a total of 218 men, in Co Wexford. William Comerford’s family home house on the Main Street is one of a pair of houses, with Maher’s next door. It is a semi-detached two-bay three-storey house, built ca 1850, but incorporating the fabric of an earlier house, built before 1840. 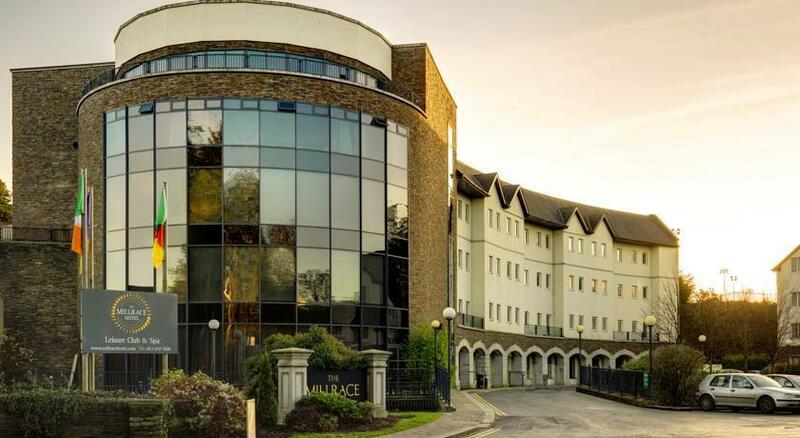 The house was renovated with opening to ground floor remodelled to accommodate commercial use, and when it passed by marriage to the Lawler family it was run as the Mall Hotel. Today it is the Post Office. When the bridge over the River Slaney was being widened in 1875, a quantity of human bones was found. They were thought to be the remains of those killed at the battle in 1798 and were buried in the old cemetery where a Celtic cross was erected in their memory. In 1884, a metal bridge was built across the River Slaney just upstream from today’s bridge. This bridge was washed down in 1965 when a flood swept through the river. But the remains of the bridge were visible from the bank of the river for many years, until it was removed in 2007, when the golf course was laid out beside the river. Newtownbarry was originally part of the large mediaeval parish of Templeshanbo. Bishop Henry Maxwell of Meath, a son of Judith (Barry) Maxwell, inherited Newtownbarry. In 1759, he married Margaret Foster, and he gave an acre of land for a churchyard in 1770. Saint Mary’s Church, the Church of Ireland parish church, was built in 1775-1776 at the expense of the Maxwell family and it was consecrated on 3 May 1776. Bishop Maxwell is commemorated with a plaque in Saint Mary’s. At first, Saint Mary’s Church had a wooden spire, but the building was enlarged later and the stone steeple was erected. The gallery of the church was made to accommodate people from Kildavin district. The rectory, off Ryland Road, was built in I805. Margaret Maxwell enlarged the local school in 1814, and the Newtownbarry estate trustees and Lady Farnham also presented the school a lending library of 200 volumes for the use of the parish. There was no Roman Catholic place of worship in the town until a small building was acquired in a side street now known as Chapel Lane, opposite Kelly’s Restaurant. In 1825, the foundation stone was laid for for a new church in the townland of Ballinapark, then part of the parish of Kilrush. The church was built by Richard Pierce of Wexford and was dedicated to Saint Mary Magdalene. It was demolished in 1970. The parish priests lived in Kilmyshall or in Meadowside, a house on Ryland Street, until 1873, when a fine house on the Market Square, once the property of the Maxwell-Barry family, was acquired as a parochial house. This became the site of the present Church of the Blessed Trinity, which was built in 1970. John Wesley, the founder of the Methodists, visited Newtownbarry on two occasions, in 1769 and in 1787. The Methodist manse and chapel in the Market Square was built about 1810 for the Revd John Wilson. In recent years this was the Chantry Restaurant, but the building is now vacant, and an auction due to take place in the Millrace Hotel earlier this week [17 November 2015] was cancelled. Most of the town is in Co Wexford, although a small area at the north end of Bunclody is in Co Carlow. The combined population of Bunclody and Carrickduff was 2,012, at the 2011 census. This is said to be one of the most ethnically-mixed towns in Ireland – non-Irish nationals account for 19.9 per cent of the population, compared with a national average of 12.0 per cent. Polish (289 people) is the largest group, followed by UK nationals (35 people).